Set amidst the vines at Sailfish Cove Wines, this luxury self contained apartment features 2 ensuited bedrooms with super-king beds. 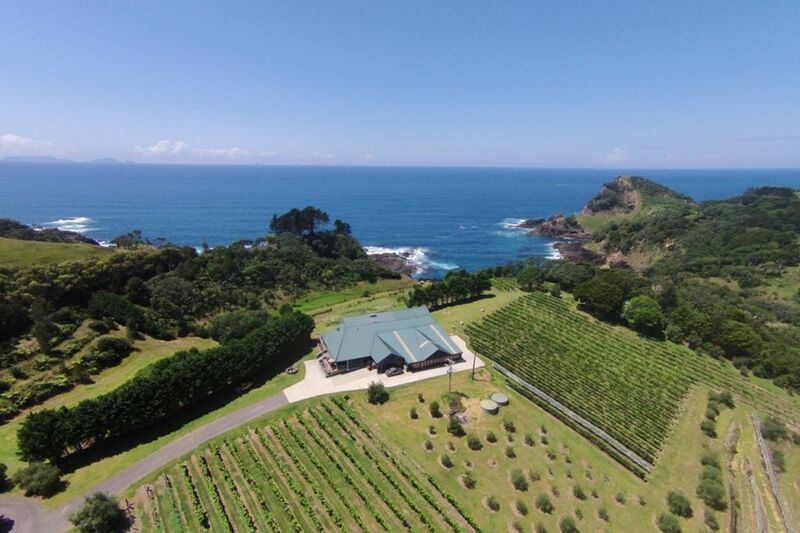 Guests are welcome to wander amidst the vines, feed the alpaca's, walk through the native bush or explore our piece of coast which features 2 private coves. The sea is at the bottom of the garden where you can catch your dinner, bring it back, cook it on the barbeque then settle down with a bottle of wine and watch the sunset from our heated indoor pool. No children under 5. No smoking. No noisy parties. No extra guests staying. The property exceeded our expectations in every way. Well equipped and very comfortable and clean. The position incredible with the most amazing views from all aspects a bonus of Shelby the dog and the alpacas too. We enjoyed being in a working boutique winery and Harvey was very informative about the grapes and wine. Both the property and location were superb! Both the property and location were superb! Immacuate and such a beautiful site we had difficulty tearing ourself away to explore the area. Having breakfast overlooking the ocean and lunch down in the cove were highlights. Sailfish Cove is a wonderful place. Sailfish Cove is a wonderful place. Highly recommended.